I have a client, a successful realtor, who for many years repeated a strange pattern of behavior that was always puzzling to me. My awareness of each new cycle of this pattern usually began with a somewhat frantic phone call during which he would confess that, yes, once again, he was flat broke, not sure how he would make his next mortgage payment and didn’t know which way to turn. This phone call was invariably followed by a coffee meeting in my office to which we would rehash the conversation from the previous time he had found himself in this position and from the time before that and … etc. He would then turn himself into a frenzy of activity, working night and day, week after week tirelessly pursuing the next sale and then the next one and then the next one. During that period, he was unavailable to anyone or for anything other than the listing of homes for sale or showing homes to potential buyers. The momentum he created was working. He was extremely good at his job and didn’t take long before he had rebuilt a sizeable nest egg and, it seemed that as soon as his bank account was promisingly full, he would suddenly suspend all activity, stop working completely and coast. During this time of affluence, he lived an extravagant lifestyle, filling his time with travel, vacations, golf and just about anything else except work. Invariably, after a few short months he would come to the realization that he was about to run out of money, I would receive the frantic call, we would meet for coffee, and the cycle would begin again. Sadly, each repeat of this pattern took a bigger piece out of him and his level of despair, regret and depression always seem to plunge a little lower than the previous time, and take a little longer to get out of. To him, the idea of creating and sustaining momentum seemed foreign, and he repeatedly paid a higher and higher price for the choices he continued to make. He began to question the wisdom of 18-hour days while frantically trying to catch up and then, having done so, the silliness of stockpiling a short-term cash future only to blow through it and, in full panic mode, return to those 18-hour days. It wasn’t the kind of momentum he wanted. He began to understand that building momentum and keeping it going was a much easier, less stressful, panic free, predictable and enjoyable way of living and he completely transformed himself into a person whose habits allowed for the three key characteristics of successful business growth. We’ve previously discussed how McDonald’s success is based on three things: consistency, replicability and sustainability. My friend borrowed that model, and carved out a work practice that he consistently repeated. He learned how to replicate his success in all facets of his career and invested a great deal of time in mastering each one. And he has sustained this practice for more than three years. He has kept the momentum going, enjoyed a predictability in his cash flow and, despite taking frequent vacations, is enjoying far greater success than he ever imagined possible. 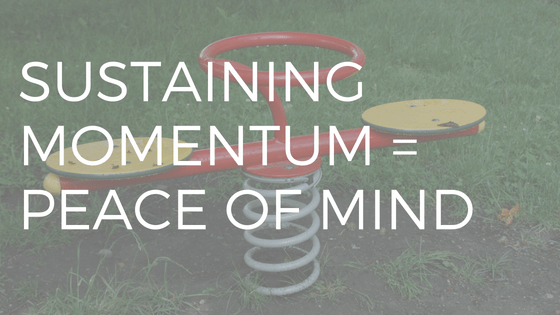 Momentum is a strange master. When it is working for us, we need to do everything in our power to keep moving forward for the simple reason that when we don’t, momentum can turn on us very quickly and guide us to precisely to where we don’t want to be. I believe everyone brings great value to this earth even if only to serve as a very good example of a very bad example, and my friend has done me an enormous service by repeatedly showing me how not to live. He is still teaching me today, by showing me how well we can all live when we take the time to gather the proper momentum that keeps us moving towards where we want to be. It took him a long time to learn this lesson. If you can identify with his experience, if you too live a life of frenzy, coast, frenzy, coast, I hope his teaching impacts you today.